Matricaria perforata of Michigan Flora. A European native, locally established as an adventive. Collected as a lawn weed near Lansing (Ingham Co.) in 1886 but not again in the state until the 1960’s. As the name suggests, this plant is nearly or quite odorless when bruised. We follow Applequist (2002) and Hansen & Christensen (2009) in applying this name to our species; sometimes subsumed under Tripleurospermum maritimum as subsp. inodorum (L.) Appleq. MICHIGAN FLORA ONLINE. A. A. Reznicek, E. G. Voss, & B. S. Walters. February 2011. University of Michigan. Web. 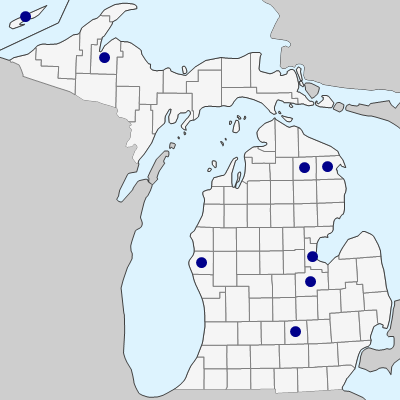 April 20, 2019. https://michiganflora.net/species.aspx?id=510.